Home ownership is one of the greatest opportunities for establishing a stable financial future. It’s also one of the biggest decisions you’ll make in your life. If you prepare properly, you’ll be able to find a home that suits your needs and your budget. Follow this road map to make your first home buying experience a positive one. Check your credit score, and clean up any issues or inconsistencies. You’ll need your score to determine a realistic interest rate, so you can factor this in when looking at homes. Pay off your debts as best as possible. Know your DTI (debt-to-income ratio), as it will be a major factor in getting a mortgage. Understand and prepare for mortgage requirements. 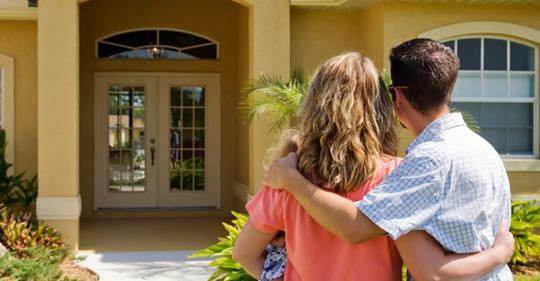 If your down payment is less than 20 percent, you may be required to purchase PMI (private mortgage insurance), which costs about 0.5 percent of your loan, though these rates vary. Practice making mortgage payments. If you’re renting, tack on the difference between your current rent and a realistic mortgage payment to your monthly living cost. Add this amount to your savings while you get accustomed to making larger monthly payments. Set your moving goal, and calculate how much you’ll need to save per month to make your down payment. Adjust to save more than 10 percent per month to help you in the long run, as you’ll need to anticipate the cost of repairs and maintenance on your home. Consult a professional. It may be tempting to go it alone, but an expert will be able to provide additional insight on the process and any hidden costs along the way. Choose a budget based on salary. Aim for a home that costs only about two-and-a-half times your gross annual salary. Only buy a home that you plan to live in for at least three to five years. You may face tax implications if you sell in less than two years. Compare monthly expenses to income. Your monthly home expenses should not exceed 36 percent of your gross monthly income. Add in details. Factor in closing costs, which often amount to 5 percent of the mortgage price. Mind the resale value. Consider the neighborhood and school district when purchasing, even if you don’t have children. Both affect resale opportunity. Purchasing your first home can feel a little overwhelming. There are many factors to consider and a lot of preparation. But if you take each phase above one step at a time, and follow our road map to home ownership, your journey should be smooth.